I’ve been following Pleasant Software for the People’s (no, I’m not making that name up) Ubercaster with great interest for some time. From the very first, the layout for workflow and the potential for what it could accomplish piqued my curiosity and as the betas flowed forth, I was with them every step of the way. Unfortunately each time I was disappointed by what it was actually able to do. I was greeted with crashes and poor quality recording, along with echos from some of the different inputs. Not much of a recommendation right? Well, I’m singing a different tune with the latest version. Before I go on, I’ll get what the program is out of the way. Most Mac podcasters are using Apple’s GarageBand and for good reason. It easily allows you to use any sound input device recognized by OS X and create digital sound. USB microphones, FireWire mixers, it’s all good. GarageBand takes those inputs and with the right gear, places them on multiple tracks for editing any way you like. 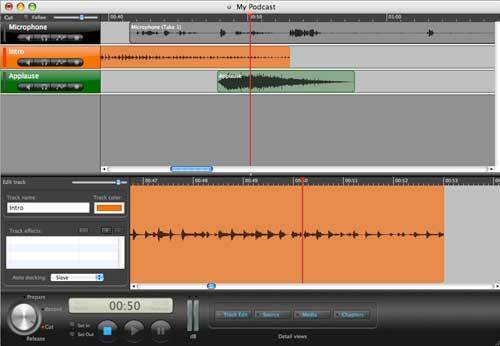 Podcasters have been very happy with GarageBand and for good reason, it just works. But there are some things that GarageBand in its current state cannot do. It can’t take audio from Skype or iChat and have them down in a separate track while recording. You can’t take audio files resident on your computer and easily place them within your recording on the fly. There are work-a-rounds of course and other software packages that allow for many of these things to be done in post editing, but no way to do it live…until now. Enter Ubercaster. 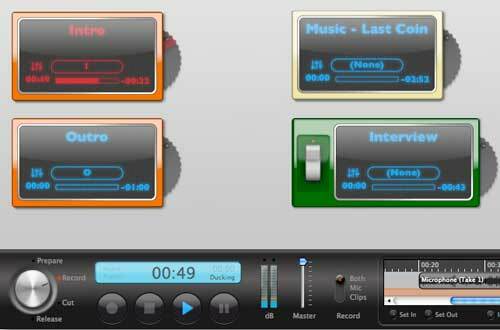 Ubercaster is very different from GarageBand in one important way. The program does many of the things needed to do in GarageBand in post-production all within Ubercaster’s workflow BEFORE you begin recording. It has a unique layout that is reminiscent of most good Mac software, drag and drop. 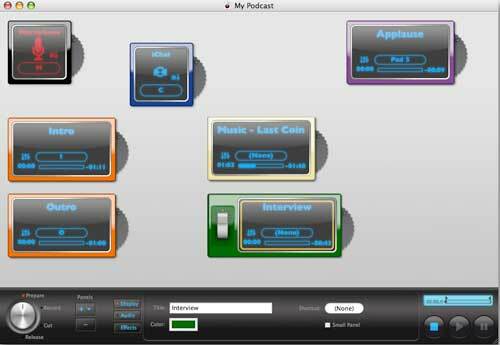 There are four layers to the program and each is well structured for making podcasts. The first element is the “Prepare Layer”. This is where you set up your inputs. An input can be a USB microphone or your mixer. If you have a mixer capable of multi-track outputs (most FireWire Mixers are capable of this and a few, but not many, USB mixers), say a XLR microphone and a guitar or midi keyboard, each track will be recorded separately with Ubercaster (to be fair, GarageBand does this very well too). Each audio file can be muted or have its volume adjusted on the fly. Every audio input works the same way. If the sound levels are too high, adjust them in the prepare layer before you start recording. Each track has various filters that can be applied in either pre or post production. If that was it, Ubercaster wouldn’t be worth a mention, but it goes far beyond this. Add additional inputs like Skype or iChat, also on their own tracks. Yes, you can record Skype or iChat conversations directly within Ubercaster (this was one of the bits that worked poorly before the latest version) without having to resort to additional software that you would have to drag and drop into GarageBand and match up in post-production. This alone makes Ubercaster a very useful tool, but it does even more. Most people use something like a midi keyboard and associate various sound bytes to its keys. 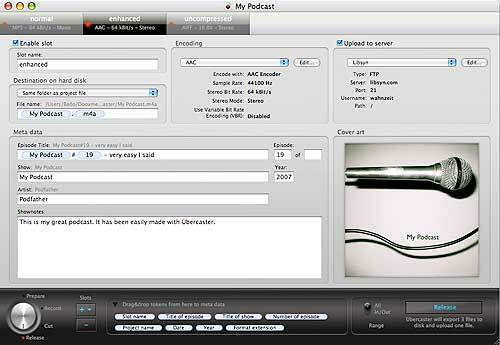 Unnecessary with Ubercaster as any sound bites, like various wav, aiff, mp3, QuickTime compatible files, pre-recorded phone calls, ect, can be dropped onto the prepare layer, and Ubercaster makes a little visual representation of it that can easily be activated while recording. No need to even click on them (and have that audible) while recording, just hover the mouse icon over the file, and within less than a second the file will play. You can also set up keyboard shortcuts for each file as well. One cool thing that you can do with sound bytes in Ubercaster is to edit the start and stop times for each file without altering the file itself. If there is a sound file you have that you don’t care for, say, the first 1.5 seconds of, have it begin at the 1.6 second point. Same with the ending. Set a start and stop point, and Ubercaster will only play that segment you specified. Usually anyway. This is one of the things that I still had problems with, though it’s possible that it was a fault in how I had it set up. OK, so you have your microphone/ mixer inputs all adjusted. You’ve set iChat and Skype up properly with their inputs and outputs all going through Ubercaster. You’re ready to record. Click the wheel to the “Record Layer” and you’re all set. Hit the record button and you get a neat little 3-second countdown before Ubercaster begins. Start recording and don’t worry if you make a mistake with that “Live” guest. Your track and their track are in perfect sync and you can remove the offensive bit later. If your guest become abusive or you just don’t want to talk to them anymore, you can set up what looks like a light switch to stop that track from recording. At whatever you point you feel it’s appropriate, hover your mouse over that sound effect of a car crash or whatever and it plays within its OWN fully editable track. Each sound that you have placed on your workspace in the Prepare layer has its own track. So, you’ve recorded your podcast, now what? Go to the “Cut Layer” and edit. Each track can edited, adjusted, moved, taken out, whatever you wish. Add chapter marks for enhanced podcasts, put in audio effects, however you wish it to sound, Ubercaster will allow you to shape it exactly as you want it to be. A bit of caution here as well. Save often. As with the some of the more advanced audio sculpting tools I spoke about in the “Prepare Layer”, if problems are going to come, it’ll be here. With previous versions, this part could be crash city, even with version 1.1 I experienced a crash so bad I had to restart the computer before Ubercaster would work properly ( I was adding audio effects to different tracks and making a lot of different changes at the time. No I didn’t save before it crashed). You can also easily add your chapter artwork in the Cut Layer as well. Just drag and drop your images and a handy slide tool lets you adjust the size. It takes almost any common graphics format as well. Doing Chapters is also very easy. Resize the tracks so it all fits in one window, put the cursor near where you want the chapter, re-listen to the section to place it exactly where it belongs, lastly select the “Chapter” option in the “Mark” menu. Make a mistake? No problem. Click on the Time stamp of the chapter and redo what time you want the chapter to begin. Lots of options to play with here. Very impressive. The last part of Ubercaster seems to work very well. It’s called the “Release Layer” and as you might guess, this is where Ubercaster does the final mix of your recording, adds all the various effects and chapter marks. Decide if you want the final mix to be a high or low end AAC or MP3 audio file. This is also where you can upload your show with Ubercaster’s built-in FTP support. GarageBand pretty much just allows you to export to iTunes (though you can certainly do almost all these things in iTunes once the file is there). Ubercaster is far from perfect. However the cool extra tricks it brings to the table allows me to forgive some of its fault. No Mac Mini? Say It Isn’t So!